Your security word provides extra protection for you and the recipient. 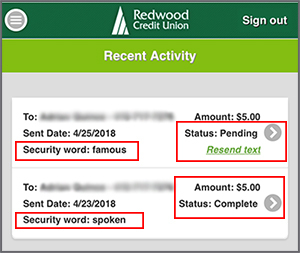 The Recipient needs the security word to claim their money. Verify the phone number or email address you are sending to with the Receiver. Make sure the Receiver knows their routing number and account number when they claim the funds. You don't need their account info, but they will. 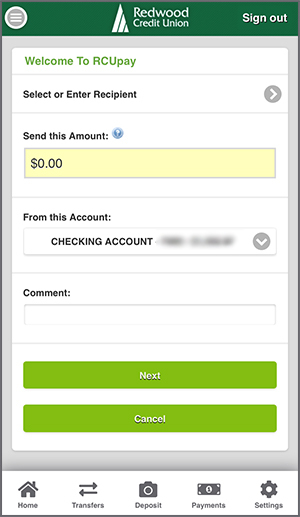 We recommend using RCUpay for sending money to people you know and trust, like friends and family. Be very cautious sending money to someone you don’t know. Once the money has been claimed, there is no way to get the money back. Be very cautious using RCUpay to purchase a product or service. Keep in mind it is as if you have handed the receiver cash. If the Receiver doesn’t deliver, or provide you with that product or service, we cannot dispute the transaction.